Enjoy UNLIMITED admission to SeaWorld® Orlando and Busch Gardens® Tampa Bay for up to 14 consecutive days for one low price! 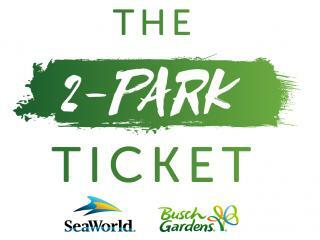 Costing less than two single day admission tickets, the 2-Park SeaWorld and Busch Gardens Ticket allows you to explore both parks at your leisure as you have a two week window to visit both parks as often as you like. Tickets are activated the first time you visit either park. You soar, you fly, you gasp, you giggle. Meet amazing marine animals and jump into their world on sensational rides and shows. Feel as though you’re thrashing through the sea as you chase your prey on Mako, Orlando’s fastest, tallest and longest hypercoaster. Manta taunts you with a head-first, face-down nosedive with the full force of riding the high seas like a giant ray. Marvel at a turtles-eye-view of the ocean on TurtleTrek, the world’s only 3D-360 experience. Waddle through the icy South Pole and feel what it’s like to be a penguin in Antarctica: Empire of the Penguin. Be awestruck by the infectious energy of our killer whale encounter. Let an ocean of fun and adventure wash over you at SeaWorld. You splash, you scream, you float, you laze. Come within a whisker of some of the world’s rarest animals, feel their energy and inhabit their world on Florida’s wildest rides at Busch Gardens. Explorers beware! An ancient Egyptian curse has been awakened in the park; can you keep your head as brand new family coaster Cobra’s Curse spins you out of control? Sprint across the Serengeti Plain® at the speed of the fastest animal on Earth on Cheetah Hunt. Freefall in a heart racing facedown descent as you stalk your prey from 335-feet on Falcon’s Fury®. There’s nothing tame about Jungala, where you can come face-to-face with orangutans or zip line through the tree tops. Get as close to the wild as you dare at Busch Gardens. Plus, with the 3 for 2 Ticket - SeaWorld, Aquatica and Busch Gardens you can also take advantage of the free bus transportation to Busch Gardens on the Busch Gardens Shuttle Express. This service departs from SeaWorld plus various locations in the International Drive and Kissimmee areas. Reservations are a must and can be made by calling 1-800-221-1339 when in Orlando.